Monte Alban is located in the Mexican state of Oaxaca. Its majestic ruins are perched on a mountain top, a few kilometers outside of Oaxaca City. 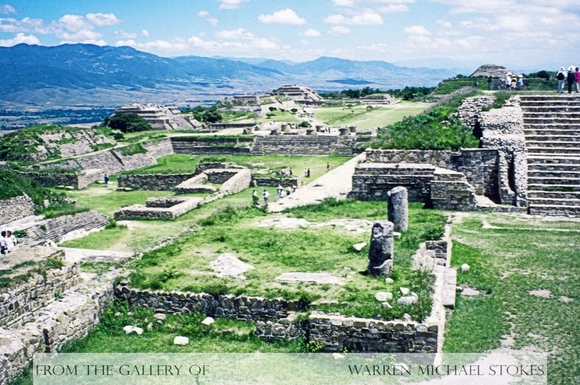 Monte Alban was one of Mexico's first major cities. It served as the capital of the Zapotec civilization for almost 1,300 years. Monte Alban was originally founded sometime around 500 BC. It is believed that the people who lived in the Oaxaca Valley, constructed the city on this location for defensive purposes, and that at one time it was a walled city. This especially becomes true when we realize that there is not enough water at Monte Alban to support any sizable population. Today, only one small spring exists on the mountain. Scientist believe that water was probably transported uphill from the Atoyac River. The remains of earthen dams and irrigation systems have been found on the sides of the mountain. The city itself formed rapidly because of the resettlement of the surrounding population. It is estimated that in the first hundred years following its founding as much as a third of the population of the Oaxaca Valley lived at Monte Alban. It was also at this time that the Zapotec written language began to emerge. During this 'classic’ era the Zapotec coqui or lords, and their royal families lived in residential palaces. These homes came with doors made out of elegant weaving or brightly colored feathers, interior patios, and multi-level rooms that ensured that the lords head was always higher than everyone else. In all, there were 57 elaborate palaces that contained from 10 to 20 people. Constructed below many of these palaces were elaborate tombs. Also, there were 2,899 lesser elaborate residences that housed between 5-10 people. It is known that the people that inhabited the less elaborate residences buried there dead in the floors of their homes. Most of these homes were built out of adobe brick and lime plaster over a stone masonry foundation. The temples found at Monte Alban had both inner and outer rooms, and they stood on pyramidal platforms. These rooms contained doors and curtains that were made up of thousands of brightly colored feathers that had been sewn together.